Every terrorist attack or case of mass violence (and I’m sure I buy into the idea that calling an act terrorism makes it different… was Sandy Hook less terrorism/terrifying? To me, it is a distinction without a difference) leads to a collective sense of pain, loss, frustration and sadness. But when the attack is targeted at a group you identify with, it also leads to a fear that produces anger. I am more sensitive when I hear of shooting of pastors or at churches; anti-Semitic incidents hurt more than others. Boston and 9/11 struck more because of geographic proximity — I knew people in both that were at “ground zero”. People who know me know that I’m not a club scene kind of guy. Just not in my DNA. However, I do occasionally go to gay clubs or gay bars. And a few times a year I’ll go to a gay happy hour event or gay networking event. And I have friends who are regulars at gay clubs, gay bars, play on gay softball teams, sing in gay choruses. I have friends who work in these clubs and bars — as dancers, hosts, bartenders. And I’m part of a church that is explicitly and positively supportive of the entire LGBT community. Today, it strikes me that all of those places — places and spaces we go to because they are safe — are potential targets for those who hate us. All day I have been sadder than usual about today’s tragedy and haven’t been sure why. This one feels more personal and, though I am not a fearful person, makes you think twice about where you go, how you identify, who you date, where you might hold hands or hug or kiss… and that makes me sadder than usual. 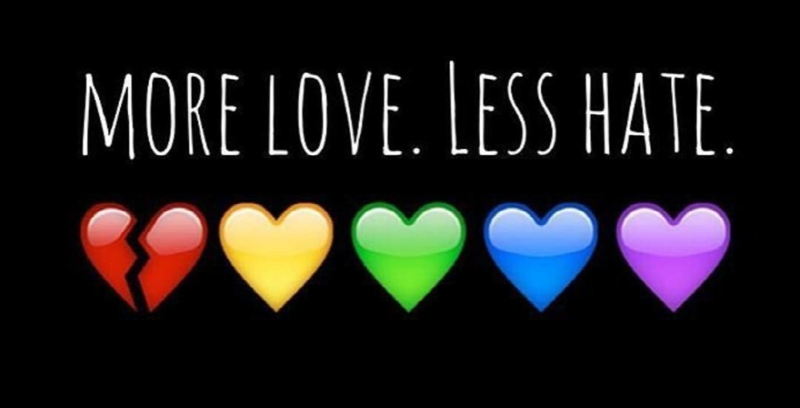 For myself and all my LGBT friends, brothers and sisters. It will be tempting in the coming days to use this incident and its anti-gay motivation to divide us even more as Americans. We should not allow it to do so. We are one community. We can disagree politically and theologically. We can shout and scream and yell and argue. We can be at odds in so many ways… but we are a we. Let’s not let hate divide us anymore. And on a more personal note… I am a deeply spiritual and religious man who endeavors to follow the way of Jesus every day. To borrow language from today’s sermon, daily I commit to Christ, to His Community and His Cause in the world. I am Jewish by birth and life (still am, always will be!) and Christian by new birth and life (have been for 24 years and will be for eternity). I am also gay. There are extreme elements within both Judaism and Christianity that reject the LGBT community. At the very extremes, there are those who call for death for LGBT people in the name of God. In both cases, these extremists find justification for their position in a particular interpretation of an ancient text (a text I love! ); in both cases, these extremists find justification in the “tradition” of their faith (and who are we to challenge 2000 years of tradition? ); in both cases these extremists claim justification in that they once held the majority view within their faith. But let’s be clear: these extremists do not speak for God (nor do I) nor do they represent all Jews or all Christians or the best of what Christianity and Judaism bring to the table. The same is true of Islam. Fundamentalist Islam, like fundamentalist Judaism and fundamentalist Christianity, is violently anti-gay. But not all Muslims share this view. As there is diversity among Jews and Christians, there is also great diversity within Islam. Our issue is not with religion — Judaism, Christianity, Islam or any other — but with extremism and fundamentalism. Please let us not confuse the issues. If we wrongly identify our enemy, we will fight the wrong war. Islam is not our enemy. And we must resist the temptation to exchange homophobia for Islamophobia.